"I can't log in to Windows 8 on my laptop. I've tried every password combination I use for any of my accounts and it wouldn't let me in. How to crack Windows 8 password so I can get past the login screen?" Forgot Windows 8 password on your computer and you get stuck at the login screen? What to do if you don't want to do a fresh install as you have some important data saved in your computer which you can't afford to lose? The only feasible option is to use a bootable CD or USB to boot off your computer and crack Windows 8 password. 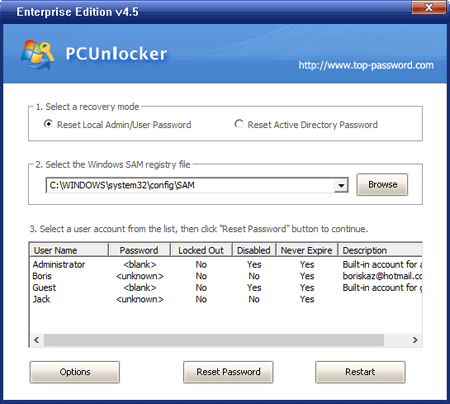 Download and save the PCUnlocker self-extracting Zip file to another computer you can log in with admin rights, then extract the ISO image file: pcunlocker.iso from it. Burn the ISO image file to a CD or USB with ISO2Disc. After one or two minutes, a Windows password cracking disk will be created. Use the arrow keys to select the BOOT tab, then change the Boot Device Priority: Set 1st Boot Device to CDROM or Removable Device. Press F10 to save your changes. Turn on your locked computer that you're about to crack Windows 8 password. Insert the Windows password cracking disk and restart the computer. The system begins to load, and you'll reach the main window of PCUnlocker program. Simply select a Windows account from the list, then click the Reset Password button to remove the password. Take out of the Windows password cracking disk and click Restart to reboot your computer. You'll find that you can log in to Windows 8 without entering a password. Apart from cracking Windows 8 password, you can also use it to crack Windows 7/Vista/XP passwords.